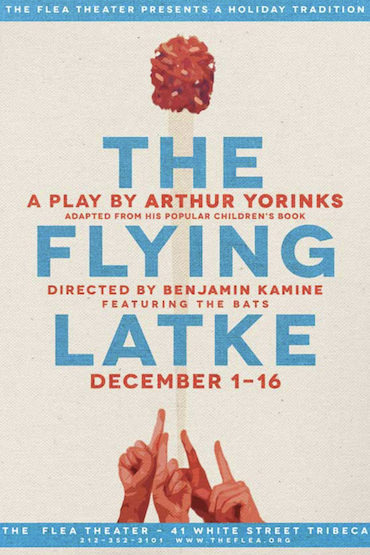 The Flea Theater is proud to present The Flying Latke by Caldecott-Medal winner Arthur Yorinks, a heart-warming tale of Chanukah celebrations, holiday dysfunction and the miracle of a certain soaring potato pancake. Directed by Flea Resident Director Ben Kamine, this limited engagement runs Saturday & Sunday mornings only, December 1 through 16 Downstairs at The Flea. Adapted by Yorinks from his classic children’s book, The Flying Latke tells the story of young Danny Silverstein and his “meshugge” family as they celebrate the first night of Chanukah. Their holiday food fight sends a latke sailing out the window and over the city, causing a UFO frenzy that traps the Silversteins in their home with their extended family visiting and nothing but latkes to eat. Following last year’s successful sold-out run, The Flea is bringing back the world premiere of the stage version of this book. Performers include Yoni Ben-Yehuda, Lydian Blossom, Tom Carman, Jimmy Dailey, Katherine Folk-Sullivan, Jessica Frey, Grant Harrison, Adam Lebowitz-Lockard, Rachel Lin, Evan Maltby, Tedra Millan, Ivano Pulito, Elly Smokler, all members of The Bats, The Flea’s resident company of actors. With scenic design by James McSweeney, costume design by Ashley Farra, lighting design by Jonathan Cottle, sound design by Jeremy Bloom and stage management by Kel Haney. The Flying Latke runs December 1, 2, 8, 9, 15 & 16 at 11am. Check www.theflea.org for the full performance schedule. The Flea is located at 41 White Street between Church and Broadway, three blocks south of Canal, close to the A/C/E, N/R/Q, 6, J/M/Z and 1 subway lines. Arthur Yorinks has written and directed for opera, theater, dance, film, and radio and is the author of over thirty acclaimed and award-winning books, including the Caldecott Medal-winner, Hey, Al. In his four decades of working in the performing arts, Mr. Yorinks has written and directed numerous plays includingSo, Sue Me, which premiered at The Kennedy Center and It’s Alive, which premiered at the Tribeca Performing Arts Center in New York. Mr. Yorinks was Philip Glass’s librettist for the operas The Juniper Tree and The Fall of the House of Usher, both of which have been performed all over the world. Mr. Yorinks, in addition to originating A New Theater of Sound in collaboration with The Jerome L. Greene Performance Space, consults for New York Public Radio and runs the company he founded, The Yorinks Theater Group.